Years ago, I was very upset when I got passed over for a promotion. I was surprised, so I asked one of the hiring members for feedback. The answer? I wore too much gold jewelry. Shocking, I know. But there was a lesson in there, if this person had just delivered it correctly. The reality of the professional world is that we all come from different backgrounds and those backgrounds should be celebrated, but you also don't want to impede progress because someone is distracted by your earrings. Here's how to adapt in the workforce without losing yourself. Hiring the perfect person for a job is not easy. In fact, nearly 50% of hiring decisions are bad ones. When I was interviewing candidates for a job for The Cru, one of the applicants stumped me with this question: "There's always one core question you're asking yourself at the heart of your decision making. What's yours for this position?" I had to admit to Alicia (the question asker) that I didn't know what it was, which led me to this epiphany: You can't find (or hire) what you don't know you're looking for. Learn how to make a good hire that lasts. I declared myself Minda Harts’ mentor the same day I met her. She didn’t ask for this. I just wanted to secure my seat on her skyrocketing journey, and oh what a ride it’s been. Minda has blazed her own path from being the first in her family to attend college to founder & CEO of The Memo, a platform devoted to helping women of color take control of their careers by providing access to boot camps, thriving community events, and inspiring leader. On top of this she has her #SecureTheSeat podcast and a book coming out in the fall of 2019, also called The Memo, that shares much-needed career advice for women of color. When I asked her what she’s had to drop the ball on in order to be an entrepreneurial superstar, she admits she wishes she spent more quality time with her girlfriends: “I am so busy building my business that I drop the ball on having girl talk and just hanging out with my Cru!” While she might not have a ton of free time, Minda is helping thousands of women on their professional journeys and encouraging them to grab their rightful seat at the table. Technically, she’s building the biggest Cru of all. I hit pause on social media, social events, and non-essential meetings for three days in order to carve out the time to devour Michelle Obama’s Becoming. It was a long anticipated read so I tried to tamp down my expectations for fear of disappointment. Little did I know that expectation management would be a theme of the book. From the opening line, “I spent much of my childhood listening to the sound of striving,” we’re made privy to the expectation that would most define her life: excellence. Courageously, Michelle Obama lets us in on the emotional and psychological journey of negotiating between what others want from her, whether it’s great-aunt Robbie wanting perfection at the piano or the media wanting perfection on the campaign trail, and what she wants for herself. In a tiny apartment on the Southside of Chicago in the 1960s, where her and her older brother Craig were raised by a city laborer and a homemaker, striving means proving. An early reader, she insists that her Kindergarten teacher allow her to retake a reading test that she failed the previous day by misspelling the word “white.” She passes and loves her gold star. But what she relishes even more is obliterating any doubt that she deserves it. By the time the former First Lady is moving out of 300 Pennsylvania Avenue in 2016 striving means evolving. A reluctant political wife, she learns to appreciate the privilege of advancing initiatives like Let’s Move and Let Girls Learn and the magnitude of serving as the anchor for the most powerful man in the world. Due to the beautifully intricate writing this book feels intimate. It’s as if Michelle Obama is curled up barefoot on your sofa cradling a cup of tea, telling you her entire story. This is not surprising given her authentic and accessible brand, but it’s still an impressive feat for one of the most popular and recognizable women of this era. The author doesn’t shy away from the struggles of being a woman, either. She writes about the resentment of being the primary breadwinner and caregiver while her husband prioritized his civil service (and workouts). She’s honest about her failing attempts at trying to meet the unrealistic expectations of being the perfect wife, mother, and professional. In the most stinging “indictment,” she realizes she’s got to cut back on fast food after the pediatrician warns her daughter is overweight. In keeping it real, Michelle Obama poignantly illustrates the dilemma of modern womanhood: it’s impossible to fully cater to the ambitions society fuels in you and to simultaneously execute the familial responsibilities society saddles you with. But she is also clear that feminism doesn’t exist within a vacuum. Michelle Obama’s female identity is inextricably linked to her identity as a descendant of enslaved people and the pressure that comes with being the embodiment of hope. Becoming is the memoir of one striving woman, the story of black America, and an invitation for us all to discover that no matter where we are in our path, we are always enough. People are often surprised to learn that I'm an introvert. Though I spend a lot of time with other people, I'm most energized when I'm alone. As I've gotten older I've found myself embracing this part of my identity and one of the results is that I no longer feel pressure to accept event invites where I know I'll be forced to make small talk all night with people I don't know. This week I received an invite that inspired me to take the risk. And I'll be forever grateful that I did. The invite was for a Salon Series at Hurston House, the name being a nod to the prolific writer Zora Neale Hurston. It's a forthcoming social club and dedicated co-working space where "we center the brilliance of Black women." Hurston House is founded by community maven Rhonesha Byng and interior designer Danielle Arps. Their inaugural event featured a conversation between two of the handful of black women who have raised millions in VC-backed dollars for their ventures. Jessica Matthews, founder and CEO of Uncharted Power, raised $12M —the largest Series A round ever raised by a Black woman founder. Camille Hearst, co-founder and CEO of Kit, raised $2.5M for her company which was acquired this year by Patreon. As an entrepreneur in the early stages of raising money for my own startup, The Cru, I thought these two women could provide me some incredible insight—they did not disappoint. My two biggest takeaways were how to prioritize my time as a CEO and how to show up. I should primarily be spending my time communicating my vision to stakeholders, making sure the company doesn't run out of money, and hiring the best talent. And that life is too short to be anything other than who you are, so I should show up as me. I also learned that vulnerability can sometimes be the best policy. I shared my nervousness about showing up to the event not knowing anyone with more than one attendee during the cocktail reception. Each time the person responded, "Me too!" and we practically gave each other a hug. Hurston House promised to be "a space where women are free to unapologetically be themselves." I'm thankful that I showed up and that they delivered. A big mistake women make when it comes to networking is believing you need to develop a deep relationship with each and every person you reach out to. Yes, strong personal connections can help you advance your career, but you need to think of those people as your advocates. Networking is just as important, but doesn't require as much relationship-building. Here's what you need to do. I probably shouldn't admit this, but I have a favorite mentee. Here's why 1) She asks a lot of questions and solicits the feedback she needs to hear, not just wants to hear. 2) She drives the relationship. She organizes our meetings, sends an agenda, and reminds me of our last conversation. This is a relief. 3) She runs through every door that I open for her. If you're in the market for a mentor, my best advice is to make the experience delightful for everyone involved. 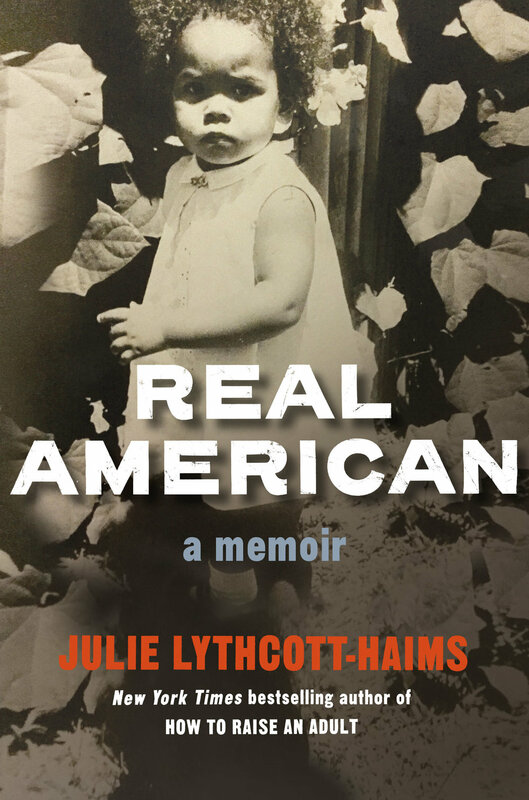 I'm one of those people who still buys paper books, but I downloaded the Audible version of Julie Lythcott-Haims', Real American, in order to cram before an event with her. As soon as I arrived at the reading, picked up one of the hardcovers and started flipping through the pages, I realized I had made a terrible mistake in consuming her words sight unseen. Her memoir is prose poetry, literally. Lythcott-Haims guides the reader through the wide, justified margins and the line breaks of her life as a the only child of a marriage between an African American father and a white British mother. Her family lives in New York, Wisconsin, and Northern Virginia, seemingly achieving the American dream, but Lythcott-Haims explores the price of the ascension. She delivers a biting account of how all of the tiny cuts of injustice can leave a gaping scar, and how a sense of community can lead to healing and self-acceptance. Real American is a powerful examination of race, identity, and citizenship that leaves you with hope for our nation's possibility. For anyone who needs a break from the false narratives and the vitriol that plagues our current discourse, Lythcott-Haims’ truth telling is breathtakingly beautiful.